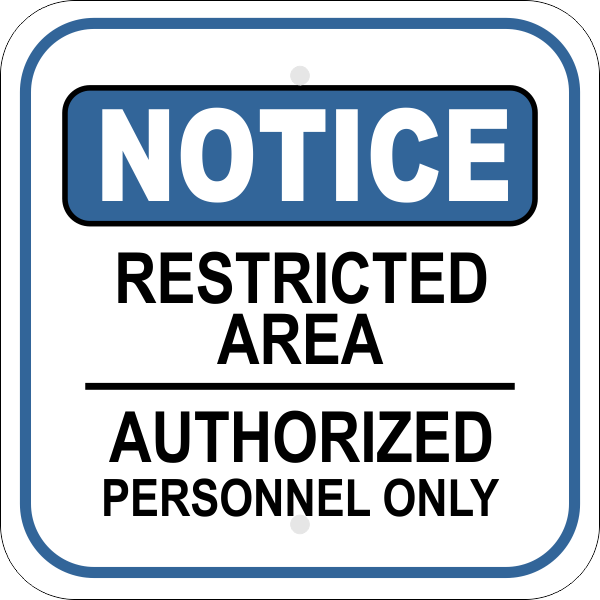 Keep unwanted visitors out of restricted or dangerous areas with this RESTRICTED AREA AUTHORIZED PERSONNEL ONLY Notice sign. It is made from heavy-duty aluminum in the USA. Full color, 12 inch by 12 inch Notice sign with "Restricted Area Authorized Personnel Only" message. Keep unwanted visitors or trespassers out of restricted areas by posting this 12" x 12" notice sign that features rounded corners.